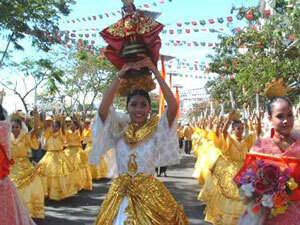 Sinulog is a dance ritual performed in honor of the holy image Señor Santo Niño de Cebu. It is danced by moving two steps forward and one step back in sync with a primal drumbeat provided by a band. The annual Sinulog Festival in Cebu is a week-long spectacle of Catholic masses, processions and concerts, which culminates in a grand parade of costumed dancers and accompanying floats depicting the different periods of history behind the development of the festival.